What Does Your Worship Bulletin Say to Visitors? Over the past three weeks, I have been a visitor to three different churches, and at each, I was struck by what their worship bulletin (program) told me about the congregation and its overall ministry. Does your bulletin look historic or modern?– Visiting a traditional and historic church, it was no surprise that their bulletin looked out of date. It looked like the church had not updated their bulletin design since the 1980’s. In contrast one church’s bulletin had a more recent design, with colors, that conveyed a sense of life in the church. Does your bulletin have pictures and colors?– similar question, but a good one to consider as we increasingly live in a world defined by visual images. 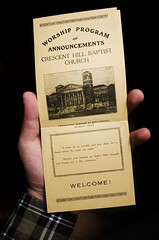 Is your bulletin easy to read?-This is more than just the size of your font. Hopefully the layout and flow of your bulletin is easy to read by visitors who will not be familiar with the rituals of your worship. Does your bulletin welcome visitors?- Certainly a welcome note is helpful, but does it help give instructions for people who are unfamiliar with when to stand, sit, sing, take communion, pray out loud, etc? Today my wife sent me an article entitled, “Is Tithing Realistic?” It is written by Peter Dunn, aka Pete the Planner, on his blog www.petetheplanner.com. If you don’t know Pete, you may not be aware that most of his blogs are about how to manage money. Usually they are logical, funny, and a bit crass, but rarely do they tackle religious topics. 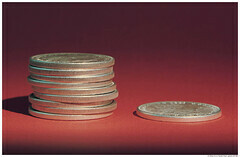 However, in this blog, Pete tries to tackle the religious spiritual practice of tithing. Or in layman’s terms, the philanthropic practice of giving 10% of your income to God, for the support of the church, its charitable programs, and its operations. How Millennial are You (Is your Church)? There is a lot of conversation in the business world about how to connect with Generation Y, aka the ‘Millennial Generation,’ as they grow and transition from youth into adulthood. On Monday, I talked about how technology can bridge the accountability gap that separates donors from beneficiaries, and in the post I shared that I would write 3 blogs showing how such examples can be used. This is the last of three posts. Having been a pastor and a leader of several nonprofit organizations, I totally understand. Question: So how can an organization create a great website that has the normal static and important information, with a website that is updated frequently? Answer: Using RSS Feeds, Blogs, and Twitter Feeds. 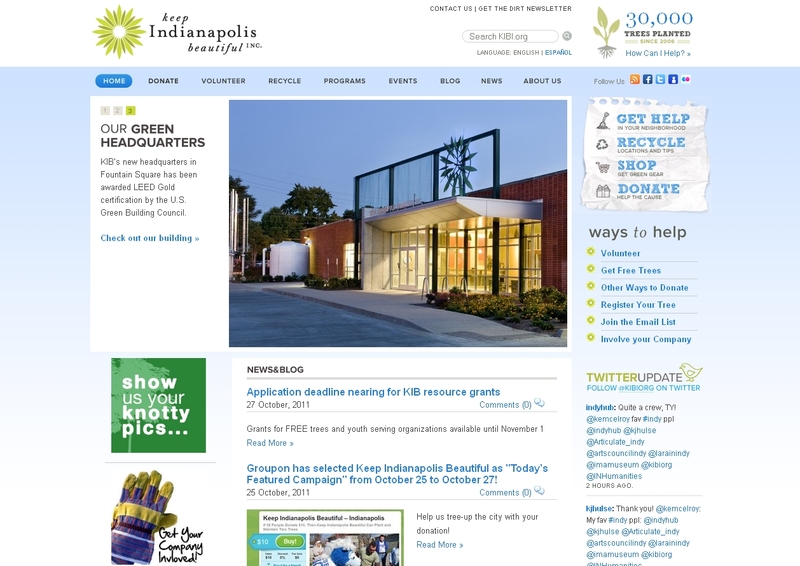 One of the best examples of this combination is Keep Indianapolis Beautiful ‘s website- www.kibi.org (Be aware that the organization uses green colors to match their environmental theme). By looking on the main page, you will see a twitter column (newsfeed) on the bottom right and a blog feed in the middle of their main page (the pic below is a screenshot- click to enlarge). By using these tools, you can use blogs and twitter to help communicate the many ways in which your organization impacts your community. 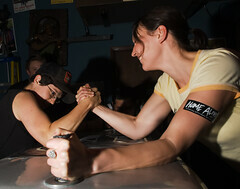 Blog Notes: Thanks to KIB for letting me highlight their page. On Monday, I talked about how technology can bridge the accountability gap that separates donors from beneficiaries, and in the post I shared that I would write 3 blogs showing how such examples can be used. This is the second of three posts. You might have heard of Mark Horvath if you listen to NPR, watch CNN, or if you are a SXSW junkie- He is the guy who started the the nonprofit organization, InvisiblePeople.tv, in 2008 to help tell the true story of homelessness in America. 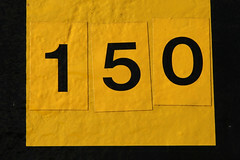 1) When I started InvisiblePeople.tv, I was close to 19 months unemployed, moving fast forward into foreclosure. I don’t think I could have filled out one more job application, and I filled out a lot. I couldn’t find work and I had to do something to keep from going crazy. Yesterday, I talked about how technology can bridge the accountability gap that separates donors from beneficiaries, and in the post I shared that I would write 3 blogs showing how such examples can be used. This is the first of three posts. Have you ever experienced listening to a member of a church, or nonprofit organization, who can’t clearly articulate the mission or the impact of the organization? Maybe the experience came as a friend asked you to donate money to support a charity. Or maybe, it happened when someone invited you to church, or as a friend described why they volunteers their time. In many cases, these experiences are awkward attempts to tell the story of an organization. However, because most of these stories are told by volunteers or members, they often miss the true power of sharing the core mission and impact of an organization.